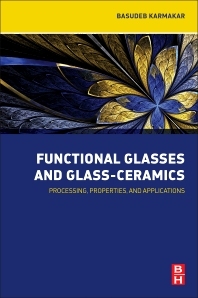 Functional Glasses and Glass-Ceramics: Processing, Properties and Applications provides comprehensive coverage of the current state-of-the-art on a range of material synthesis. This work discusses the functional properties and applications of both oxide and non-oxide glasses and glass-ceramics. Part One provides an introduction to the basic concept of functional glasses and glass-ceramics, while Part Two describes the functional glasses and glass-ceramics of oxide systems, covering functionalization of glasses by 3d transition metal ion doping, 4f rare earth metal ion doping, crystallization, laser irradiation micro fabrication, incorporation of nanometals, the incorporation of semiconductor coatings, the functionalization for biomedical applications, solid oxide fuel cell (SOFC) sealants, and display devices, and from waste materials. Part Three describes functional glasses and glass-ceramics of non-oxide systems, covering functional chalcogenide and functional halide glasses, glass-ceramics, and functional bulk metallic glasses. The book contains future outlooks and exercises at the end of each chapter, and can be used as a reference for researchers and practitioners in the industry and those in post graduate studies. Professor Karmakar has over 32 years’ of research experience on the preparation, characterization and property evaluation of different types of glass nanocomposites, glasses (viz. chalcogenide, silicate, borosilicate, fluorophosphate, phosphate, borate, silica, etc. ), glass-ceramics, ceramic oxide powders, gels etc. His notable R&D contributions are in the process technology development of nanometal- and semiconductor-glass hybrid nanocomposites, Nd- and Er-doped phosphate laser glass, phosphate based radiation sensitive (RPL) glass, high density radiation resistant lead silicate (RSW) glass, optical glass, ultra-low expansion transparent glass-ceramics, machineable glass-ceramics, ferroelectric glass-ceramic nanocomposite, rare-earth (RE) doped luminescent glasses and glass-ceramics, rare-earth doped nanocrystalline nonlinear optical (NLO) glass-ceramic nanocomposites, thermally cyclable glass-based solid oxide fuel cell (SOFC) sealants, and high purity silica glass by sol-gel technique.